DJ Cassidy is a busy man. When he’s not on the road playing gigs night after night, he’s in the studio working on music. When he’s not DJing A-list parties for celebrities like Diddy (whom he was first discovered by), he’s collaborating with top names in the music business – Lil Yachty, R. Kelly, and Robin Thicke to name a few. But his latest work is something different. Instead of finding huge artists to be featured on his tracks, Cassidy is choosing to let the music speak for itself. His new single, “Blame It On The Freak” is out today, featuring vocals by Royal Love and guitar by Nile Rodgers. Working with his production partner, Greg Cohen, Cassidy describes the new single as a mysterious, minimalist approach to his signature, funk-filled, dance floor anthems. The track represents the power of music and the “undeniable force” that brings out the freak in all of us. We had a chance to talk with Cassidy before the release of his latest track. Keep reading for an exclusive look into the life of this busy DJ and the making of his newest music. Let’s go back to the very beginning and how this all started for you. I read that you started learning to DJ at 10-years-old. Did you dive right in and teach yourself or did you have help? For my 10th birthday, I asked for turntables and I got two turntables and a mixer. I taught myself and had many mentors growing up. But I spent many hours in my bedroom just practicing and learning as much as could. I definitely sacrificed a lot of my social life, but in the end I was rewarded. DJing really gave me my identity, so the way I look at it is that I kind of sacrificed my social life but gained an amazing social life later on. Music was really my only hobby. I’ve always been one-dimensional in that way and put music first. I only cared about music. 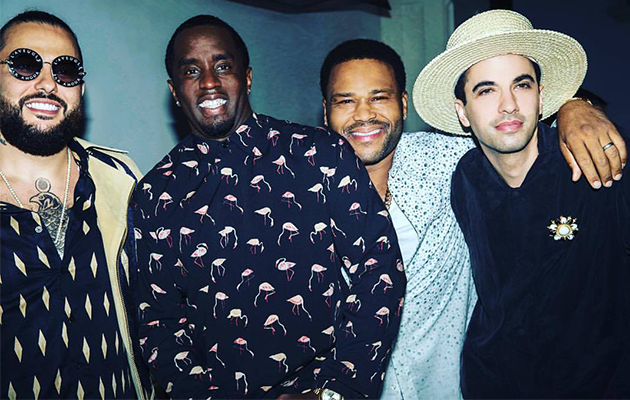 Left to right: Belly, Diddy, Anthony Anderson, and DJ Cassidy. What would you say is a career highlight for you? I know you were asked to DJ the inauguration of President Barack Obama in ’09, as well as Beyoncé and Jay-Z’s wedding in ’08. That’s insane! Haha, yes, there are many, but I’d say the night I met Puffy (Diddy) is a standout moment. I was DJing at this little place in NYC called Lotus. It was circa 2001 and I was an 18-year-old kid playing in the small back room. I was just happy to be there. I remember it was pouring rain that night and so there wasn’t much of a crowd. The room was kind of empty. Around 3:00 am, I see Puffy come out from the shadows and realized he had been there the whole night. He started dancing, essentially by himself in the middle of the room. I was playing funk and soul music from the ‘70s and ‘80s for the next two hours or so. It had to have been close to 5:00 am when Puffy came up to me and asked who was DJing. He couldn’t believe it was this young kid playing that old school music as if I had lived through that era. He wrote his phone number on a napkin and I remember thinking he couldn’t be serious. I finally worked up the courage to call a few days later and eventually spoke to Puffy directly. A week later, I was playing at a Grammy Awards party and my life completely changed. To this day, I still trace back so many of the people I’ve DJ’d for to that one night. So, do you keep in touch with him Diddy? Oh yeah, he’s a mentor and a friend. I still play a lot of his parties. I DJ’d his 2017 New Year’s Eve party and a recent party at his house for the Grammy Awards. I also recently starred in his latest Ciroc (Vodka) commercial. We definitely keep in touch and have a great relationship to this day. You’ve been creating original music for a few years now. Do you prefer being in the studio to DJing live at this point in your career? No, not really. It’s not so much a competition between the two because I still get a high from doing both. I’ve been DJing since 1991 but my first track release was in 2014 so producing is a lot newer. I still feel like I have a lot to prove on the producing side, but it puts an exciting pressure on me to be better. DJing and producing are very related. They both fuel one another and for me, it’s just two different releases for creativity. You’ve said that your new single, “Blame It On The Freak” represents the power of music and the “undeniable force” it has that brings out the freak in us. Was there a specific event that sparked inspiration for this track? Any crazy story behind it? Honestly, this song was conceived in a studio session with my co-writers. It was a late night session in LA – very collaborative. I think the track, for me at least, just feels like an LA night. I had spent practically my entire life in NYC, so when I started coming to LA more and eventually moved here last year, I definitely feel LA has affected my music. It’s not so much a specific place or about going out, but just the way LA feels at night. The air, the palm trees, driving through the hills, usually on the way to the studio. I’ve always had these fantasies of paradise and the vibe just fits with the track. 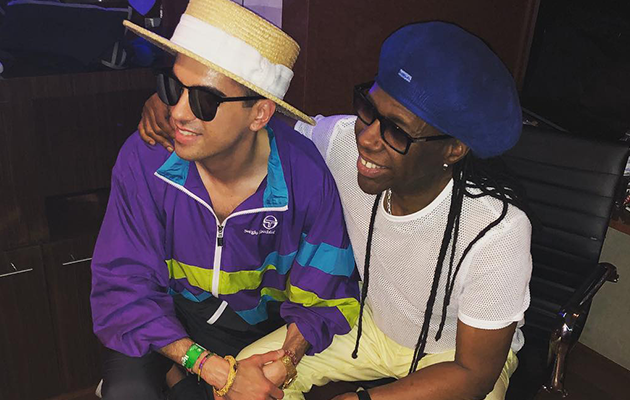 DJ Cassidy with guitarist, Nile Rodgers. I heard that you have two more tracks following “Blame It On The Freak.” When can we expect those to drop? My DJ career moves fast. I’m always on the go, playing a different event every night. I wanted my music to reflect that and keep up with that pace. So I’m releasing three singles in a row, one every four to eight weeks. I’m on the road every day of the year, so I want each song to feel that way – like its own event in a way. You stayed away from having features on your newest music, but are there any artists that you dream about collaborating with someday? I mean, of course. I’d have to say The Weeknd, Bruno Mars, Beyoncé. Those are probably a dream for any musician – but they’re just some of best in the world. Do you have any advice for DJs trying to come up in the industry? Everyone always told me that as a DJ and an MC, my voice is the most important tool. I stuck by that and over the years developed my own style on the mic that really allowed me to create appeal and create a brand. I always think to myself now, if I didn’t have a mic, I couldn’t perform. I think it’s important to find your style or your trademark and deliver that consistently. Be sure to follow DJ Cassidy on Instagram or Facebook. Let us know what you think of “Blame It On The Freak” and download it now BPM Supreme.